January 2010 is Volcano Awareness Month in Hawaii. The USGS’s Hawaiian Volcano Observatory (HVO), in co-operation with Hawaii Volcanoes National Park, Hawaii County Civil Defense, and the University of Hawaii at Hilo, has put together a rich and varied programme of events ‘to promote increased awareness of and respect for the volcanoes on which Hawaii’s residents live’. The HVO website has links to further information about Volcano Awareness Month, including a complete overview (PDF) of the month’s events and activities, an at-a-glance Calendar (PDF), a list of events in Hawaii Volcanoes National Park (PDF), details of evening talks (PDF), a Volcano Awareness Month Magazine (PDF) published by local newspapers, and Hawaii County Mayor Billy Kenoi’s Proclamation (PDF) that set the whole thing going. Looks like it’s PDF awareness month in Hawaii as well. As part of Volcano Awareness Month, the excellent Volcano Watch column available at Hawaii 24/7 and written by HVO scientists is looking beyond the science, at ‘how volcanoes have influenced and shaped human experience, as seen through the lens of literature, movies, and art’. This week the subject is the strong ties between volcanoes and religion. Posted by admin in Hawaii, volcano images, volcano tourism, volcanoes. That unusual and always interesting corner of the web Environmental Graffiti (‘an eclectic mix of the most bizarre, funny and interesting environmental news on the planet’) has a long-standing and thoroughly admirable interest in volcanoes. Their latest article of volcanic interest, ‘Anything for the perfect volcano shot!’ by Karl Fabricius, talks to Dr Tom Pfeiffer of VolcanoDiscovery about the excitements and dangers of volcano-visiting, and includes some stunning photographs from the heart of the action in Hawaii. 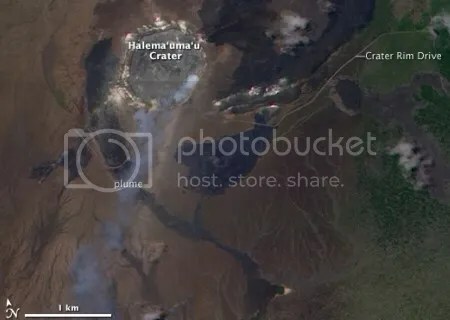 Drillers working for a geothermal energy company in Hawaii got very geothermal when they drilled right into a magma chamber, reports the BBC today. Apparently a crew working for Puna Geothermal Venture was putting an exploratory well into eastern Big Island, through Kilauea’s lava fields, when they unexpectedly hit hot rock at a shallow 2.5km. The stuff ascended the bore but cooled and solidified a few metres up, before a world-engulfing Hollywood-style catastrophe could occur. This happened in 2005, but the event is only just now being reported at the AGU Fall Meeting in San Francisco. The material in the magma chamber is slowly cooling, providing an opportunity for scientists to study the processes of differentiation that occur as magma solidifies into continent-forming rock: ‘it could be this is how continents could have been started to be built on the planet’, says Prof Marsh in an interestingly-formed sentence. ‘Don’t these people look where they are drilling?’ asks Chris Rowan at Highly Allochthonous.